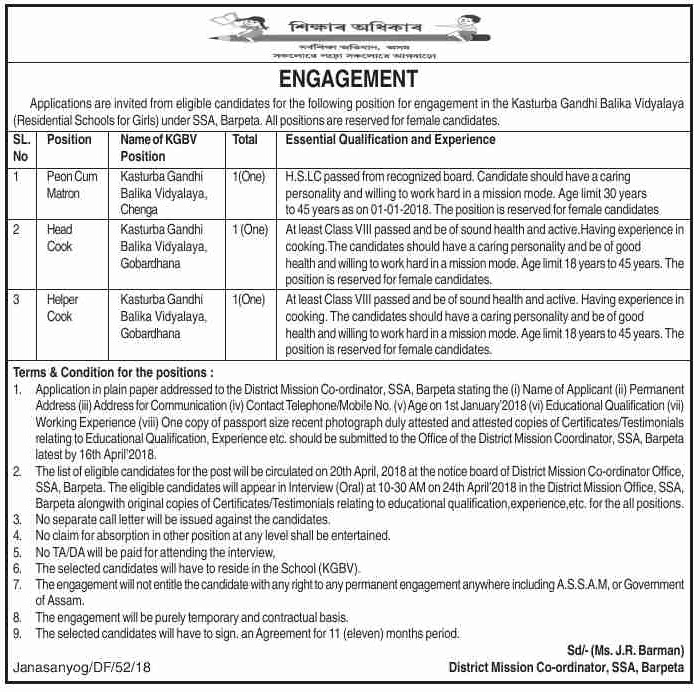 Applications are invited from eligiblel candidates for the following position for engagement in the Kasturba Gandhi Balika Vidyalaya (Residential School for Girls) under SSA, Barpeta. All positions are reserved for female candidates. Last Date: 16th April, 2018. Essential Qualification: HSLC passed from recognized board. Candidates should have a caring personality and willing to work hard in a mission mode. Age Limit: 20 years to 45 years as on 01-01-2018. The position is reserved for female candidates. Essential Qualification: At least Class VIII passed and be of sound health and active. Having experience in cooking. The candidates should have a caring personality and be of good health and willing to work hard in a mission mode. Age limit: 18 to 45 years. The position is reserved for female candidates. Age Limit: 18 to 45 years. The position is reserved form female candidates. Application in plain paper addressed to the District Mission Co-ordinator, SSA, Barpeta stating the (i) Name of Applicant (ii) Permanent Address (iii) Address for Communication (iv) Contact Telephone/Mobile No. (v) Age on 1st January/2018 (vi) Educational Qualification (Vii) Working Experience (vii) One copy of passport size recent photograph duly attested and attested copies of Certificates/ Testimonials relating to Educational Qualification, Experience etc. should be submitted to the Office of the District Mission Coordinator, SSA, Barpeta latest by 16th April, 2018. The list of eligible candidates for the post will be circulated on 20th April, 2018 at the notice board of District Mission Co-ordinator Office, SSA, Barpeta. The eligible candidates will appear in Interview (Oral) at 10-30 AM on 24th April 2018 in the District Mission Office, SSA, Barpeta alongwith original copies of Certificates/ Testimonials relating to educational qualification, experience, etc for the all positions. No separate call letter will be issued against the candidates. No claim for absorption in other position at any level shall be entertained. No TA/DA will be paid for attending in interview. The engagement will not entitle the candidate with any right to any permanent engagement anywhere including A.S.S.A.M. or Government of Assam. The engagement will be purely temporary and contractual basis. The selected candidates will have to sign. An Agreement for 11 (eleven) months period.